Deputy Editor of the Mida news site. The latest line of anti-Israel attack claims the Jewish state withholds water from the Palestinians. As usual, the haters have their facts wrong. The issue of water rights in the West Bank is constantly raised in regard to the Israeli-Palestinian conflict, appearing again and again in public discourse around the world. According to critics of Israel, the Jewish state selfishly exploits the area’s water supplies and denies access to the local population. In doing so, the critics say, Israel is not only abandoning its responsibilities to the West Bank Palestinians, but ruthlessly and illegally abusing the natural resources of the occupied territory. This idea has become extremely widespread in the international media, and was recently voiced from the Knesset plenum by the President of the European Parliament, Martin Schulz, causing a minor scandal in Israel and abroad. As with all attacks on Israel, the truth is much more complicated and, to a great extent, precisely the opposite of what the critics claim. When one examines the relevant data, it becomes clear that, under Israeli rule, the Palestinian water supply has become larger, more technologically sophisticated, of higher quality, and much easier to access; almost entirely due to Israeli efforts. The truth is, most of the claims made against Israel on this issue are nothing but empty propaganda. They are based on claims that are simply untrue and/or based on a lack of basic knowledge of the topography of Israel and the West Bank. The latter in particular often creates total confusion in regard to everything connected to the legal issues surrounding West Bank water sources, and especially its important underground aquifers. To avoid such confusion, this article is largely based on statistics published by the Israeli Water Authority, and research by Professor Haim Gvirtzman, a hydrologist from the Hebrew University of Jerusalem. Hopefully, it will give a much more accurate picture of one of the most contentious disputes in the current Israeli-Palestinian conflict. The attacks on Israeli misuse of West Bank water supplies are based on three central myths, all of which are based on inaccurate and often deceptive claims. The first myth is that Palestinians now have less access to water than they did in the past because of Israeli rule over the West Bank, violating the Palestinians’ human rights. In fact, like many of the claims this article will deal with, the opposite is the truth. Before Israel took control of the West Bank after the 1967 Six-Day War, the West Bank’s water system was primitive in the extreme. Much of it was based on technology dating as far back as ancient Roman times, using aqueducts that operated by the force of gravity and sporadic wells dug on an individual or communal basis. Water was often transported by hand. 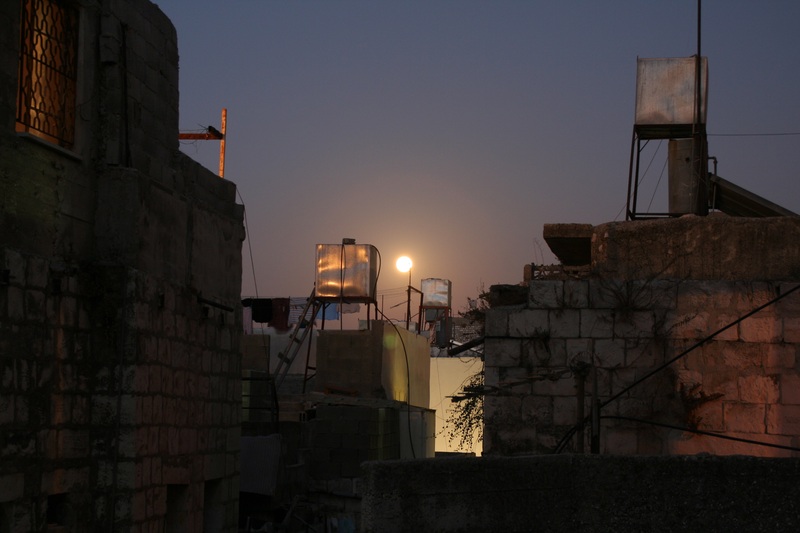 Only a handful of places, such as Ramallah, used a modern pumping system—built during the British Mandate—and water was piped into a very small number of private homes. At the end of Jordanian rule in 1967, the West Bank Palestinians received a relatively low 65 million cubic meters of water per year. Whatever the depredations of the Israeli occupation may have been, there is no doubt that they did not apply to the issue of water supplies. Within five years of the Israeli takeover in 1967, the water supply grew by 50 percent; and the IDF Civilian Administration, which rules over the territory, established a pumping system that brought water directly to city centers, where residents could fill water containers for personal use. This was followed by the creation of a modern infrastructure to supply water to the population of the West Bank. It is true that, initially, this was because of the Israeli settlement movement. In order to supply water to these new communities, a pumping infrastructure was built throughout the territory and connected to the National Water Carrier in Israel proper. But this new infrastructure did not only supply Israeli settlements. It also serviced surrounding Palestinian areas, bringing a noticeable improvement in their standard of living. Whatever the circumstances under which this infrastructure was built, its results cannot be denied: Up to the signing of the Oslo Accords the Palestinian water supply doubled, reaching approximately 120 million cubic meters per year by the time the interim agreements were signed in 1995. Since then, it has almost doubled again. In 2010, the Civil Administration reported consumption at 190 million cubic meters per year. Official Palestinian publications have acknowledged this. 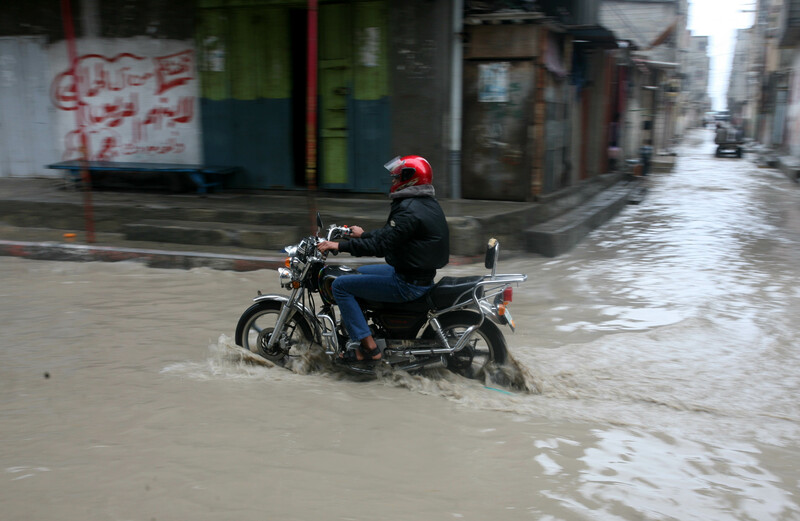 In 2004, according to the Palestinian Hydrology Group, there were 643 cities and towns connected to the water system, out of 708 Palestinian settlements. Taken together, 97 percent of the Palestinian population was connected to the territory’s water system; for the most part, directly to their own homes. In terms of per capita consumption, there has also been substantial improvement. In 1967, per capita consumption stood at 93,000 liters per year. In 2006, it stood at 129,000 liters per year, close to the average in Israel proper—170,000 liters per year. From “The Israeli-Palestinian Water Conflict: An Israeli Perspective,” by Prof. Haim Gvirtzman. Published in Mideast Security and Policy Studies no. 94, January 2012. 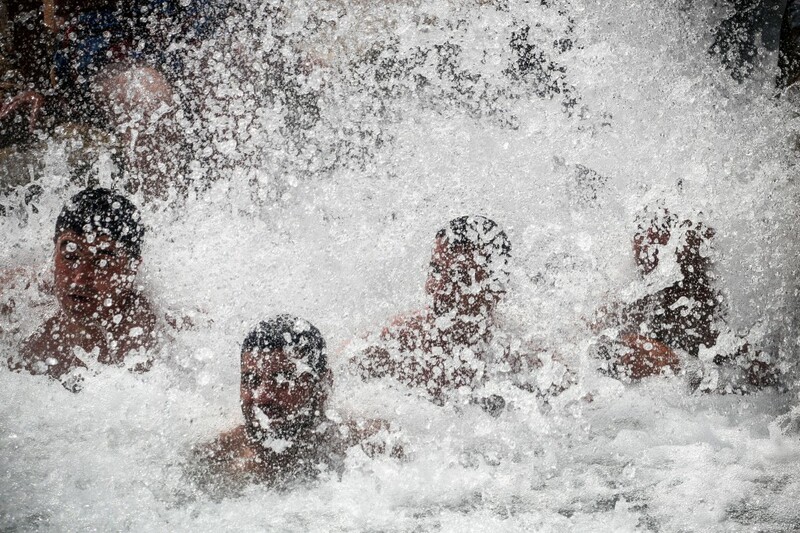 Even after the Oslo Accords, Israel continued its involvement in the Palestinian water system. According to the Accords, Israel is required to supply 31 million cubic meters per year to the Palestinians. It seems, however, that Israel has exceeded this by a considerable degree. According to statistics published by the Israeli Water Authority in 2012, Israel has added no less than 53.3 million cubic meters per year to the Palestinian water supply. From “The Issue of Water between Israel and the Palestinians,” published by the Israeli Water Authority, March 2009. Whatever one may think of Israeli rule over the West Bank, there seems little question—even among the Palestinians themselves—that in terms of water supplies, Israeli succeeded in doing in 30 years what the British Mandate and the Jordanian kingdom failed to do. The second myth holds that the entire water supply of the West Bank belongs to the Palestinians, making any use of this water by Israel a violation of international law. Since Israel is an occupying power, say the critics, it is illegal for it to make use of the occupied territories’ natural resources, including water. This claim is both hugely simplistic and shows a basic ignorance of international law. It is clear even to the average person that water is not like other natural resources, such as land. There is a simple reason for this: Water tends to move. It is a dynamic resource and rarely stays in one place. Due to the complications inherent in laying claim to such a resource, international law has not reached a consensus on the issue. Water supplies in Israel and the West Bank illustrate the complexity of this problem quite well. For example, rainwater falling on the hills of Shechem drains into Israel’s coastal plain—within the ’67 lines—and from there into the Mediterranean Sea. Who does this water belong to? To even begin to answer this question, it is important to know the topography of the area in question. Most of the West Bank is hilly, while much of pre-1967 Israel is flat and low, especially the Sharon Plain and the Negev Desert—which includes the Dead Sea, the lowest place on Earth. As a result of this, most of the rain that falls on the high ground of the West Bank, such as the hills of Samaria, flows down into the northern Jezreel Valley and then into Israel’s western central plain. This rainfall supplied much of Israel’s water even before the Six-Day War. In the same way, groundwater accumulated in the West Bank tends to flow downwards and collect in wells located on lower ground, again on territory located in Israel proper. As a result, a large amount of the water originating in the West Bank has ultimately arrived in Israel as a result of entirely natural forces. Taking all of this into consideration, one can begin to understand the issue of West Bank water rights in light of international law. Although, as noted above, no legal consensus on the subject exists, several basic principles have been adopted. Because water is often a highly contentious issue, the intention behind these principles is to avoid or minimize conflict over water sources. Although they are not binding in a practical sense, they do constitute a useful starting point. 1. Preference is given to the party that has historically held the rights to the water supply in question, as well as the party most dependent on it. 2. Unused water sources must be developed before any redistribution of resources takes place. 3. Waste must be minimized and use of the water source must be optimized before any redistribution of resources takes place. As noted above, the topography of the West Bank is such that, due to natural forces, the majority of its water has always ended up in Israeli hands, and this was the case long before the occupation of the West Bank. When we examine the table below, which presents the historical water consumption from each of the three aquifers in millions of cubic meters per year, it becomes clear that Israel’s historic right to the majority of the water has been long established. 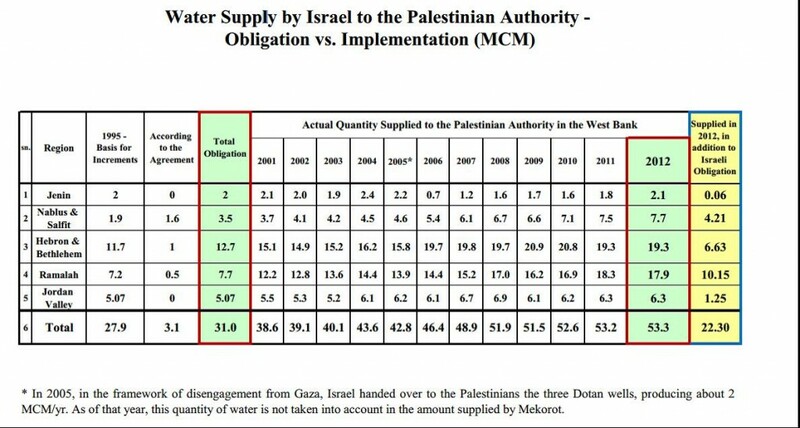 From statistics found in “The Issue of Water between Israel and the Palestinians,” published by the Israeli Water Authority, March 2009. What about unused water sources? The majority of this is located in the eastern aquifer, which flows beneath the Jordan Valley. It contains approximately 70 million cubic meters of water a year that is left unused. The rights to this water were granted to the Palestinians under the Oslo Accords. Unfortunately, the Palestinians have yet to exercise these rights to any significant degree, and the failure do so is entirely their own. For example, over 40 potential drilling sites in the Hebron area were identified and approved by the Israeli-Palestinian Joint Water Committee; but in the two decades since then, drilling has taken place in only three places, and this is in spite of substantial funding provided to the PA by donor nations. This is both tragic and ironic, because undertaking these drilling projects could entirely solve the area’s current water issues; instead, the Palestinians have chosen to both blame Israel for their water problems and drill into the Western aquifer, which provides water to Israel. In regard to waste and optimal use of water sources, it is also clear that the Palestinians are very far from fulfilling the most basic requirements of international law. Because the PA does not properly maintain its water system, it suffers from a 33 percent rate of water loss, mostly due to leakage; in contrast to an 11 percent loss from the Israeli system. 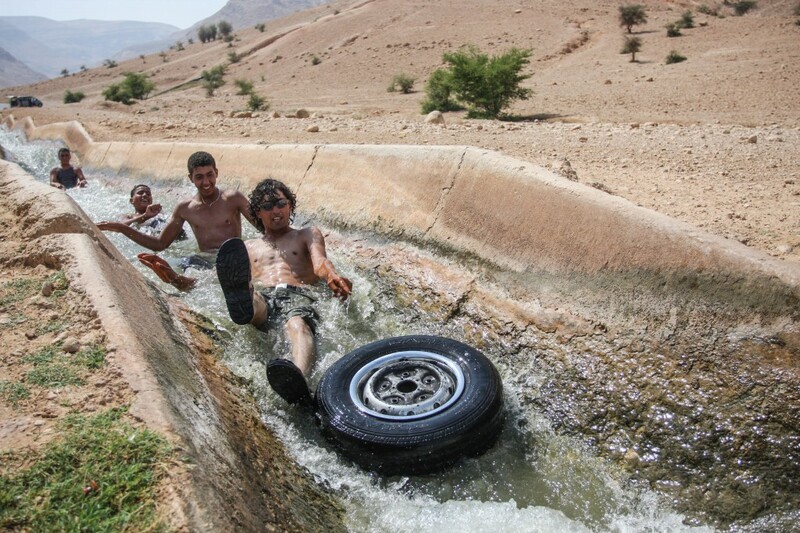 In addition, a large percentage of Palestinian agriculture uses surface irrigation, a primitive and wasteful technology profoundly unsuited to the region’s limited water sources. 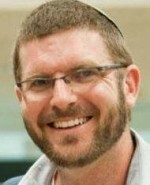 The use of more efficient methods, such as drip or sprinkler irrigation, as well as better water purification and distribution, would both conserve resources and free up a much larger amount of fresh water for home use—according to the Israeli Water Authority, as much as 10 million cubic meters. It seems, then, that Israel’s critics are not only wrong, but entirely ignorant of the accepted principles of international law. According to these principles, Israel holds the majority of water in the West Bank by right; the Palestinians do not make proper use of their existing water sources; nor do they make the required attempts to exploit untapped resources. And none of this is due to Israeli malfeasance. The third and final myth accuses Israel of polluting the aquifers beneath the West Bank and destroying other water sources, thus wantonly destroying the area’s ecology. Perhaps more than any other, this claim is so completely untrue that it could only be made by someone without any knowledge of the facts whatsoever. The truth is, again, precisely the opposite. While most Israeli wastewater is purified in modern sewage treatment plants, most Palestinian wastewater is discharged into the environment, causing very serious pollution. Out of 52 million cubic meters per year of Palestinian wastewater, only 4 million is treated in Palestinian facilities; another 14 million is treated in facilities established by Israel; the rest—approximately 34 million cubic meters a year—is left to pollute the environment. It is important to understand that, because of the area’s topography, this wastewater often flows into Israel proper, and thus causes serious damage to Israel’s own water supplies, as well as the surrounding environment. In particular, major damage has been done to the Kishon River in the north, which feeds into the bay of Haifa; the Alexander River, which flows into the Mediterranean Sea near Hadera; the Kidron River, which stretches from Jerusalem to the Dead Sea; and the Hebron River, which descends into the valley where Beersheva is located and from there into the sea. As a result, the quality of life for everyone living near these rivers has been damaged. But first and foremost, the environmental damage the Palestinians have caused has harmed themselves, as they have been forced to close more and more wells due to pollution. It is difficult to see how the Palestinians can blame anyone for this but themselves, since donor nations have provided $130 million specifically earmarked for sewage treatment. Up to now, however, the Palestinians have invested only NIS 25 million (approx. $7.2 million) in building one sewage treatment plant in al-Birah. Moreover, the Palestinians have not accepted the offer of an additional $300 million for building such plants. As a result, the damage to the ecology of both Israel and the West Bank is only getting worse. There is no doubt that the Palestinians have no positive sentiments toward the Israeli occupation of the West Bank, nor can they be expected to. Israel and its supporters, however, should not accept every single criticism made of the Israeli presence in the West Bank on this basis. Accusations must be backed up by solid fact and placed in their proper historical context in order to be legitimate. The issue of water rights, supplies, and infrastructure, is perhaps the most glaring example of illegitimate criticism. On this issue, fact and context have been entirely dispensed with in order to make Israel look as bad as possible. In fact, as has been demonstrated above, Israel’s record on water issues is a good one; it has consistently acted within its rights and according to accepted legal conventions. Moreover, it is clear that the Palestinians’ record is a bad one; and it is they, not Israel, who have failed to live up to their obligations under international law. To the extent that a viable water supply infrastructure exists in the West Bank, it is because Israel built and maintained it. While this infrastructure was certainly constructed, in part, to service Israeli communities, its benefits have not been denied to the Palestinians, and no one familiar with the statistics involved can claim otherwise without being patently dishonest. That Israel is so consistently blamed for this problem is especially problematic because it makes it less likely that the Palestinians will deal with it themselves. As shown above, the Palestinians have the ability to both live up to their obligations under international law and solve their existing water problems in doing so. The money, technology, and knowledge they need all exist and are available to them from both foreign and Israeli sources. That the Palestinians have either chosen not to avail themselves of such aid or cannot do so effectively due to internal problems is tragic, but it is not the fault of the State of Israel.